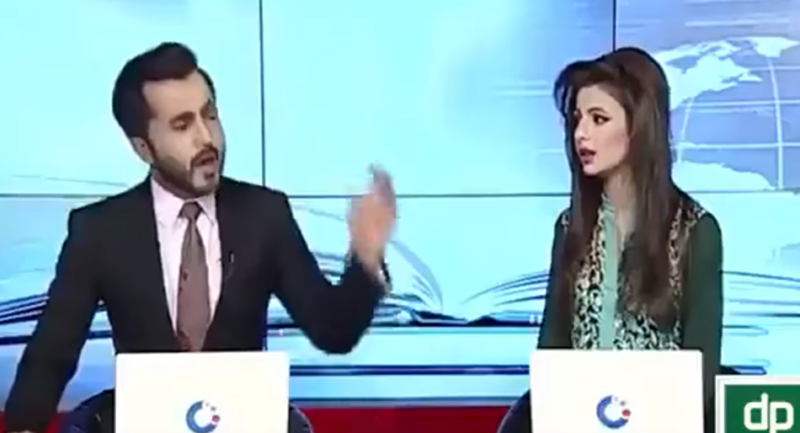 A leaked video of a bitter exchange between two Pakistani television news anchors has gone viral on social media. The anchors, who work at the Lahore-based news channel City 42, were filmed having a squabble in Urdu. The video has been circulated online thousands of times. "How am I supposed to do the news bulletin with her?" the male anchor grouses at the start of the video. "She's saying ‘don't talk to me.'" "I was talking about your tone," replies the female news anchor. "Speak to me with respect." "How have I disrespected you?" the man asks impatiently. "Ignorant," the woman mutters in response, clearly directing the insult at her colleague. "Tell her to watch what she says," the man says irately. "Is all of this being recorded?" "There's no end to her tantrums," he adds at the end of the video. There was a myriad of reactions by social media users. "Girls always do this type of rubbish," one user commented on the video uploaded on the MediaLive Facebook page. "The guy must get some learning that how to speak with women. Idiot," another viewer added, while a third wrote, "And they lived happily ever after." The internet, of course, loves to see normally unflappable anchors in private meltdown. Last year, Lawrence O'Donnell, an American television pundit and host of "The Last Word," was forced to apologize after behind-the-scenes footage from his August 28 episode showed the anchor swearing at his crew because of "insanity in [his] earpiece." In the video, O'Donnell loses his cool after a voice talking about a "Labor Day run down" was leaked into his earpiece. And who could forget former Fox host Bill O'Reilly, annoyed after a series of bad takes, snarling, "F*ck it, we'll do it live"?